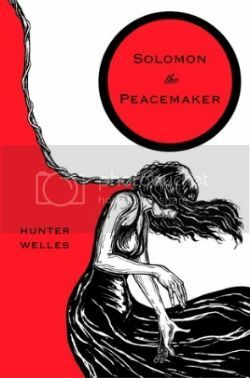 Solomon the Peacemaker by Hunter Welles is about Vincent Allen Chell, a suspected terrorist. The story is told in the form of a one-sided interrogation as Vincent describes the motivation for his actions. Solomon the Peacemaker is set in a futuristic society where war no longer exists because international decisions are made by an artificial intelligence called The Peacemaker. Fearing that human governments wouldn’t take orders from a robot, The Peacemaker’s builders factored in a human host. Each host is connected through a brain interface to The Peacemaker and serves for a term of seven years, but no hosts have ever survived the disconnection process. Its builders assumed that The Peacemaker would be a final solution to many of the world’s problems for thousands of years, but they didn’t factor in Vincent. While The Peacemaker has strong defenses against rebel groups, it only takes one man with a vendetta to send the whole system crashing down. Rather than explaining himself from an ideological perspective, Vincent talks about his life. He talks about his first wife Yael, and how the couple became involved with an anti-technology prayer group led by a man named Preacher. Members of the prayer group call themselves by aliases, and it gradually becomes obvious that the group is about more than just prayer. Vincent keeps his distance from the group, because even though he believes that artificial intelligences are an abomination, he doesn’t believe that violence is the answer. Yael’s eventual suicide has a major impact on Vincent’s attitude toward life, and reshapes his worldview dramatically. His overwhelming need to destroy The Peacemaker is no longer purely ideological, it’s personal. To be quite frank, I didn’t really feel like I was invested in Solomon the Peacemaker or cared what happened until about 75% of the way through the book. I was apathetic. There wasn’t anything objectively wrong with the story or the writing, it just didn’t hold my interest. However, once I got past that point, everything came together and we began to see Vincent as an unreliable narrator. He thinks he’s motivated by a just cause, but he had been given a lot of memory-erasing drugs by a crazy cult, and so we don’t know if what he tells us is real. You begin to question whether Vincent is doing the right thing at all, or whether he’s been deluded into thinking that his cause is just. The beauty of it is that there is no real answer. I’m not sure where that leaves me. As much as I enjoyed the ending of the book, I came extremely close to not finishing it at all. I suspect that others will enjoy Solomon the Peacemaker much more than I did. hm, not sure what I would think of this. I do like the cover, though. It’s different. The cover was what drew me to the book originally, and I did think the premise was interesting. I think it was just one of those cases where I thought I’d enjoy a book much more than I did and it ended up not being for me.